How much does an alarm system cost? Well actually not as much as you think, a wireless system with two sensors(PIR’s) and a door contact would start from around 400 pounds subject to a site survey. Some companies offer a deposit plus payment plans with monitoring and maintenance included but you will end up paying 2 – 3 times more. Will the Alarm system be Insurance Rated (certified)? 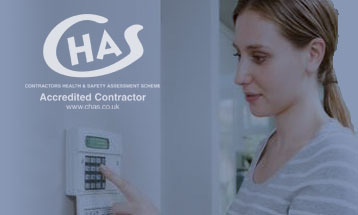 This means the installation company has to be approved by either SSAIB or NSI (NACOSS) and you will be issued with a Certificate of Compliance which should be presented to the insurer as required. Can I set my alarm system at night? Yes, it will allow you to move around upstairs freely, whilst leaving downstairs alarmed, this can be tailored to suit your requirements. If you live in a bungalow then various zones can be shutdown to allow access to bathrooms etc. Can I set my alarm with my pets in the house? Providing pet sensitive detectors have been fitted and dependant on the number, size and actions of pets, this should be possible. Please ask for this consideration. Will my Intruder Alarm work if there is a power cut? Our alarms will work in the event of a power failure, alarm control panels incorporate a standby battery which will power the system in the event of a mains electricity failure. The industry standard is for the battery to power the system for a min of 8 hours. If the system is armed and there is a power failure the standby battery will hold the alarm in its current status until the power is restored. It is therefore essential to keep your Intruder alarm system regularly serviced to avoid battery failures. What happens if the alarm activates? In the event of the system being armed the alarm will ring for a pre-programmed length of time before silencing and re-alarming itself. If the system is unset and a fault occurs all you need to do is enter the code to stop it. My alarm activates but my neighbours just ignore it? Invader Security can link your alarm to your telephone line or through a GSM link so that it can call your mobile, your office, your relatives or chosen keyholders. That means someone is always alerted if there is a problem. Will my wireless internet connection interfere with the alarm? The intruder alarm system uses a dedicated frequency specifically used for the security industry and as such should not interfere. Chime is a facility that can be assigned to certain zones. When selecting the chime mode to enabled the control panel will emit a tone (Two different tones available) when the chime circuit activates. This function is normally programmed to the main entrance door. Invader Security Systems include a 1 year warranty this can be extended providing an Invader Security maintenance agreement is in place. Can I upgrade my system at any time? The control equipment that has been selected for your current security needs is expandable thus being able to suit your future needs. Should this not be the case we can always advise on alternatives? How long does it take to install an alarm system? Generally a domestic alarm system can be installed within a day. Whilst every care is taken to keep dust to a minimum during installation, occasionally dust needs to be vacuumed by the engineer ensuring your property is returned to its original cleanliness. What types of burglar alarm systems are there? The best type of alarm for your home depends on your personal preferences, budget, where you live, what your home is like and what level of protection you need. A key consideration is what you would prefer to happen when your alarm goes off. Bells-only alarms make a noise, but do not contact anyone (such as the police or the homeowner). Speech diallers, a device built inside an alarm, automatically contacts you or other nominated friends and family when the alarm is triggered. Alternatively, you could get a monitoring contract, whereby you would pay a company monthly or annually to take action or call the police if the alarm goes off. Alarms can be either wired or wireless. Wireless alarms look nicer, are generally easier to install and can be removed more easily if you move house. They use battery-powered sensors that communicate with a control panel using radio signals. While this type of alarm tends to be cheaper to install professionally, the alarms themselves can be more expensive. Wired alarm systems usually need to be installed by a professional, as the alarm wires will need to be hidden, so labour costs are higher. When a bells-only (also called audible) alarm is triggered, it makes a loud noise, which will hopefully alert someone in the area to the situation and/or scare off an intruder. However, unlike a monitored alarm or one with a speech dialler, it won’t automatically contact a named person or the police, so there is no guarantee that anything will be done. It’s worth thinking about the kind of area you live in before deciding to get a bells-only alarm. Is there an active neighbourhood watch giving you confidence that someone will call the police? Or perhaps you have friends and relatives who live very close by who you could count on to take action? What maintenance will my burglar alarm require? Regular maintenance should highlight and reduce defects, give you peace of mind and give you more redress if something goes wrong. If you get a burglar alarm maintenance contract, your alarm will be checked once a year (twice a year if you want a police-monitoring contract) by an installer coming to your home. Costs for this vary, particularly as you can get different levels of maintenance. Having your alarm system professionally maintained can help tackle any problems with false alarms. It is also a requirement of some insurance companies and a requirement if you want a monitoring contract in addition (see below). Can my burglar alarm be monitored? There are three options if you would like to have your burglar alarm monitored, so someone will be alerted if it goes off: a speech dialler, a keyholder contract or a police contract. You can get a monitoring contract for a wired or wireless alarm, but the alarm itself and the installation does need to conform to certain standards. There are two types of monitoring contract: keyholder and police response. With both types, you pay extra per month or annually to have your alarm system monitored, which means the nominated keyholder or the police will be alerted when the alarm goes off. The idea is that the alarm system connects to a receiving centre, so if your alarm is triggered, they will be notified. The receiving centre will first of all ring your home asking for your password identification. If this is incorrect or no one answers, either they will take action, inform the keyholder(s), or call the police, depending on what type of contract you have. What is a speech dialler? A speech dialler (also called text alert), is a device built into or connected to a wired or wireless alarm. The idea is that when the alarm goes off, the speech dialler will call or text a set of phone numbers of your choice, for example family members or your mobile, until it gets an answer or can leave an automated message. This can be a good alternative to a professional monitoring service (see below), as a professional service involves monthly fees. Speech diallers are usually free as they are built into the alarm, so they just need to be activated or connected to the phone line. Keyholder monitoring is done through a company (the ‘receiving centre’), which will either respond itself when the alarm is triggered, or will contact your nominated keyholders. Nominated keyholders must be within 20 minutes of the house, be able to drive and have access to the house. It’s your responsibility to keep the alarm company up to date with their details, and suggest alternatives if they are away. Alternatively you can ask a Keyholding company, the 24-hour service offered by monitoring, as well as knowing there is a dedicated company which is liable if action isn’t taken, may offer you piece of mind. In addition to a receiving centre being made aware your alarm going off, this type of contract means the police will also be contacted by the receiving centre. If you would like this kind of alarm system contract, it’s important to check that the company is registered with the local police force. When your alarm goes off, two indicators within the house, such as a door contact and a sensor must both have been triggered to warrant police call out. This is to avoid false alarms wasting police time. The Metropolitan Police says that a massive 92% of all alarm activations nationally in recent years have been false alarms. If your alarm system has three false alarms (four in Scotland) in 12 months, you’re struck off the police register, and they won’t respond if the alarm goes off. It’s worth noting that paying for this service won’t guarantee the police will come out. It depends on what other incidents are happening and what other resources are available. "We have used Invader Security on our business offices and our home, we have found them to be honest, punctual, clean and professional and would readily recommend them to friends and business colleagues."